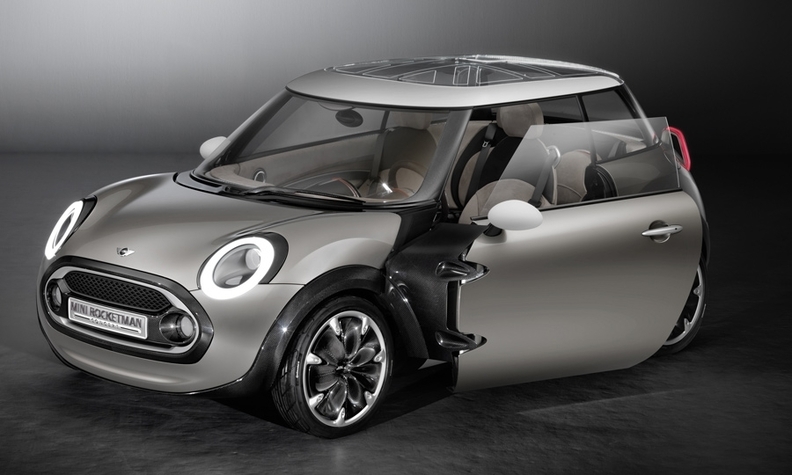 The Mini Minor may be based on the Rocketman concept, pictured, which was unveiled at the Geneva auto show in 2011. FRANKFURT -- BMW Group and Toyota Motor Corp. may expand their cooperation to include the joint development of a new addition to BMW's Mini range, a German auto magazine reported. BMW is considering an entry-level car for Mini that would be called the Mini Minor, Autobild said. Toyota could launch its own version of the model, which may be badged as the Starlet, the report said. Automobile magazine also reported on the cooperation talks between the two companies. A Mini spokesman declined to comment on the report, telling Automotive News Europe that it was "mere speculation." If built, the Minor is expected to be smaller and less expensive than Mini's core model, the three-door hatchback. Based on the Mini Rocketman concept unveiled at the 2011 Geneva auto show, the Minor will be 3450mm long, which is 370mm shorter than the three-door hatch. With a sticker price of about 13,500 euros, the Minor would undercut the three-door Mini hatch by nearly four thousand euros. The Mini Minor’s name would revive a moniker first given to the early versions of the car built by the UK brand Morris in the early 1960s. BMW is expected to add an electric version of the Mini Minor after the first conventionally powered models arrive in 2018 or 2019, the report said. Mini is shaking up its lineup as it seeks to make the brand profitable. While the Minor would be an addition to the portfolio Mini is likely to discontinue three weak-selling models: the Coupe, Roadster and Paceman. BMW and Toyota formed an alliance in 2011 to cooperate on diesel engines and have since expanded the collaboration to include fuel cell and battery cell technology, lightweight materials as well as the joint development of an architecture and components for a sports car.